Mahamantra Festival Celebrations - this weekend! ~ The Toronto Hare Krishna Temple! Mahamantra Festival Celebrations - this weekend! Over 46 years ago, His Divine Grace A.C.Bhaktivedanta Swami Srila Prabhupada stepped off the steam ship Jaladutta onto American shores and rest is history. From the moment Srila Prabhupada set foot on western soil, he began to work miracles! ISKCON (International Society for Krishna Consciousness), popularly known as the Hare Krishna Movement, was formed in 1966. Today, 45 years later, there are over 400 centers all over the world with thousands of followers and Srila Prabhupada's legacy lives on in his students and books! In order to celebrate the historic occasion of Srila Prabhupada's coming to the west, celebrations are taking place in every corner of the world! In Toronto, we have organized a ten day festival called the Mahamantra Festival. The festival commenced on Sept 10 and will go on till Sept 20! The coming 4 days are going to feature special events and we hope you can join us in these events! Thursday, September 15 - Srila Prabhupada Memories Movie Night at Hare Krishna Temple, 243 Avenue Road from 6:30pm - 8:00pm. Popcorn and juice will be served as we sit back and watch some memories of Srila Prabhupada! 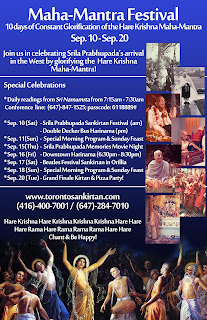 Friday, September 16 - Harinama in Downtown Toronto - meeting at the temple at 6:30pm. 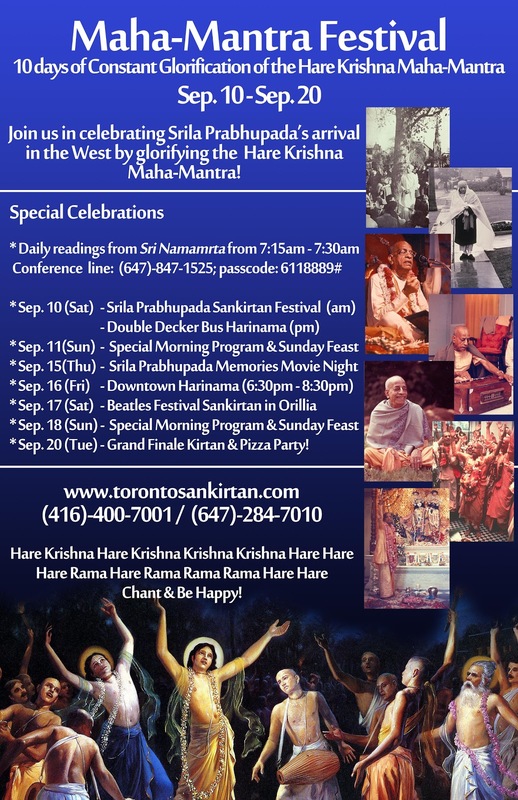 With the famous TIFF (Toronto International Film Festival) on, it is the perfect opportunity to go and share the Hare Krishna Mahamantra with enthusiastic Torontonians! Saturday, September 17 - Beatles Festival in Orillia (Pre-Registration is required). George Harrison and the Beatles expressed great interest in the Hare Krishna Movement and helped devotees in UK to establish the movement there. So when the organizers of the Beatles Festival in Orillia contacted us, we had to join them to honour George Harrison and his love for the Mahamantra. If you are interested in joining, please email the Sankirtan team at toronto.sankirtan@gmail.com . Sunday, September 18 - Special Sunday Feast glorifying Srila Prabhupada! If you feel inspired, you can also join us for Mangala Arati (Morning Program) from 4:30am. For more inspiration, join our daily calls from 7:15am - 7:30am with the reading from Sri Namamrta. These calls will go on only till September 20! So dial in tomorrow :-)! It is the perfect way to start your day! On Tuesday, September 20, we will be having a Grand Finale Kirtan & Pizza Party - an extremely grand way to cap off 10 days of fun and bliss with a special kirtan night at the Hare Krsna Temple! We hope to see you at these events this weekend!